Whereas it's socially acceptable for women to have structured, intimate relationships with others based solely on an emotional connection, men need to center their close friendships with one another on an activity, as clinical psychologist Tim Weissman reveals in Eric D. Anderson's fascinating documentary Way of the Puck . And while his experience counseling war veterans still suffering from post-traumatic stress ensures that Weissman is no stranger to the inner workings of male camaraderie, we also realize that he's particularly well-suited to dissecting the topic himself upon discovering that he's a ten-time champion in the testosterone dominated world of air hockey. Although he's kind, married family man away from the table, Weissman is a near rock star among his particular and notably dwindling tribe of competitive, obsessed air hockey die-hards who come together at least once a year for meetings and matches under the leadership of “The Guru,” Mark Robbins in an effort to save the once world popular game from mass extinction. Having single-handedly driven around the country with a rented truck to buy up any remaining tables and accessories left after the manufacturer announced they were going to stop production in the late '70s before he began to develop newer, sleeker and more fan-friendly air hockey tables, Mark Robbins has been wed to the game for over three decades. Namely, Robbins has spent the last thirty years of his life dealing with outside forces that don't abide by the rules of the game and continually threaten his relationship with the table, considering the rise and fall of the economy and the popularity of arcades and video games. In addition to air hockey's origins with NASA, cinematographer turned documentarian Anderson introduces us to two other core players upon whom he focuses during his nicely paced, alternately exciting and thoughtful film festival award-winning feature length directorial debut. While Weissman is the likable PhD holding everyman champion, the film's underdog who similarly steals our hearts is embodied by the perpetually second place ranked Andy Yevish -- a former boxer turned painter who draws caricatures and works on simple people/places/pets picture commissions to pay the bills. Fighting against age and bodily limitations, Yevish gives himself one last year to win or quit altogether since now in his thirties he can't play at the level he had previously because the physically demanding sport requires so much fast movement that a five minute match is likened to an hour of ice hockey action. Easily the most “controversial” character in Puck's core quartet is fast-talking confident businessman Michael Rosen who's determined to turn his passion for the game into profit. Although he has some exciting promotional ideas and a moving story about falling for air hockey as a child that's bound to compel you, the others aren't sure what to make of him, despite understanding that Rosen's goal is genuine and that times are tougher than ever for the world of table games. 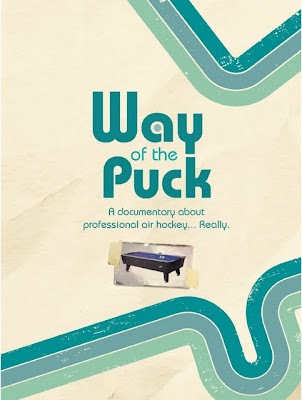 Given its narrow scope of topic told through the wide medium of film, Way of the Puck is frequently and rightfully compared to recent superb subculture niche documentaries such as The King of Kong: A Fistful of Quarters and Wordplay among others. Wonderfully executed and refreshingly humanistic, Anderson's in-depth exploration of a competitive field that few realize even exists immerses us in a world we may otherwise have never experienced and we're glad to have made the journey. Likewise as we watch, we begin looking at the hobby as a sport with fresh eyes, knowing that in the future air hockey may “Never Be Pucked” again if new players don't find themselves inspired to go after this particular Puck.